Last year, 157 people wished you a "happy birthday" on Facebook. This year... only 127. What did you do to piss off those 30 people? Why did only three people comment on that perfect picture of your toes in the sand? And why the hell isn’t anyone engaging with your superbly crafted political commentary? Better check your phone every five minutes until someone does! That notification "ding" will come any moment now. If any of these scenarios hits close to home, you might be suffering from social network site addiction, or SNS addiction. Yes, these are the times we live in, when you can become addicted to a virtual world. The good news is, once you understand a little of the science behind this addiction, you can take steps to break it (hint: do not replace it with crack). The term "SNS addiction" might bring to mind images of black-clad tweens hunched over a computer screen in the middle of the night. Well, that depiction isn't exactly wrong, but it's not exactly right, either. The terrifying beauty of SNS addiction is that it’s an equal-opportunity addiction. While it's not yet listed in the Diagnostic and Statistical Manual of Mental Disorders (which is kind of like psychiatry's Bible), SNS addiction is just as likely to strike extroverts as it is to affect introverts -- surprising if you think introverts would be more likely to be drawn to the anonymity Internet interaction. But there's another side to the social media coin; extroverts are more likely to crave social validation on Facebook, Twitter, Instagram, Peach, etc. These sites become an extension of real interaction, rather than its replacement, and an extrovert’s brain responds to a Facebook like with the same excitement as any other reputation booster. So every time your new profile pic gets a new reaction, your brain lights up and waits anxiously for the next one. You may not be a black-clad tween, but there’s a good chance you’re hunched over a screen right now praying for that next little boost. If you find the seemingly infinite timeline to be hypnotic, it’s because your brain craves the relaxation brain waves activated by social media, and Facebook continues to deliver. If it weren’t for a little modern-day demon called FOMO, this might not be such a bad thing. Recent studies, however, have shown that FOMO is "robustly linked to higher levels of social media engagement" no matter when or where the itch might strike (i.e. on the toilet, in class, driving… you get the picture). Since the dawn of time, there have been parties to which you have not been invited. There have been beaches on which you didn’t chill (and Netflix?). There have been exes hooking up with new people. And you were blissfully ignorant of it all. Now, though, you can see your ex-girlfriend making out with a new guy at a beach party you weren’t invited to. Technology for the win! Nobody, especially extroverts, wants to be left out, and with social media, you never have to be. You’re exposed to everything happening in the world, immediately, at any hour. When all you’re doing is sitting on the toilet looking at your phone, and Kyle is skydiving in Honduras, Amanda’s getting promoted, Jose’s buying a new house, and Abigail is surfing in Maui, it’s no wonder several (several) recent studies have linked increased Facebook use to depression, anxiety, and loneliness. Sounds a lot like drugs, huh? But can you really call spending time on Facebook an "addiction"? Just because a habit is repeated over and over again doesn’t mean it's a full-on addiction, right? Sure. But the brain activity of Facebook addicts is pretty similar to that of gambling and drug addicts, with "similar" being the most important word. Gambling and drug addicts have the same powerful motivating factors lighting up in the brain, but they also lose the ability to inhibit their impulsive behavior. Facebook "addicts" seem to maintain the ability to limit their behavior… they just don't. 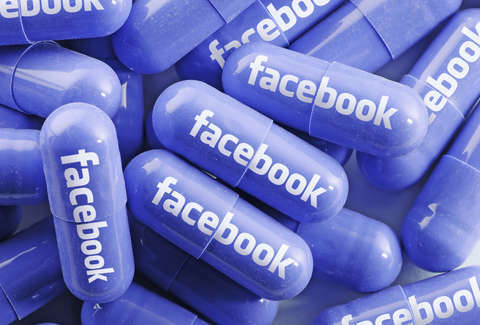 Granted, liking a comment on Facebook isn’t going to kill you unless your keyboard short-circuits and explodes, so it might not have the pressing quality of a serious coke addiction. What might be slowly killing you is the context of your Facebook use. If it’s interrupting your sleep, you’re setting yourself up for pretty much every health disaster imaginable. If you’re quicker to react to a notification "ding" than a traffic signal, you should really stop driving and get a cab. With almost 20% of college-age students being either addicted or in the "alert stage" of addiction, and some academic work calling for social media intervention, maybe it’s time to override your stupid brain and acknowledge the risks and signs. Enough explanation, just give me the antidote! In a few years you might see Celebrity Rehab: Social Media. For the rest of you, there are a few steps you can take to limit your social media use. Dr. Kimberly Young, founder of the Center for Internet Addiction, says, "If you want to beat Facebook addiction, you need to know how big of a problem it is." The first is as simple as understanding that you’re being played. The addictive nature of social media is built into its very design: Suggested friends you already know pop up seemingly magically, ads are perfectly tailored to your interests, your location can be pinpointed and recommendations of restaurants can be made for you. Once you’ve looked behind the curtain, set some rules. Maybe stop doing using it on the toilet, during dinner, or in bed? "Keep a list of just how much time you’re spending," Dr. Young advises, "and take the list with you." Always ask yourself what your purpose is for checking Facebook. If you don’t have a good reason, maybe it can wait. One effective measure that might take some getting used to: responding offline. Try calling someone on his birthday, instead of leaving a half-assed comment on Facebook. It’ll knock his socks off. Since you’re already offline, Dr. Young suggests asking loved ones if they feel like you’re addicted to social media. You may not like the answer, but it might improve your relationship with these people once you’ve gotten through your knee-jerk reaction to punch them in the face. And if you’re in serious need of some intervention, it’s pretty simple to change your alert settings, delete apps, or even install programs that block sites during certain hours. There are plenty of theories, steps, and techniques that could do the trick, but only you know what’ll work for you. It may take some trial and error. Finally, Dr. Young recommends a good old-fashioned purge. That doesn’t mean you have 24 hours to murder your neighbors without consequence. Instead, ask yourself if having 300 “friends” is more work than it’s worth, and is your feed suffering the consequences? Don’t be that jerk who posts something like, "I'm cutting friends, so if you’re seeing this, you’re one of the lucky ones" Just do it, and you may find yourself with fewer dings to salivate over. The siren song of social media is hard to resist. We’re hardwired to become addicted, and it’s been designed to keep us that way. It’s undoubtedly opened up a whole new world of connections, and with that comes a whole new world of problems not studied before. The science is still young, but it’s probably a good idea to pay it some attention before you hop back on Facebook. Nicholas Knock is a freelance writer for Thrillist who just wants one more notification ding, please. You can follow him on Twitter @nickaknock even though he doesn’t say much.